With more and more projects starting in the warmer weather, it's time to start looking for the right construction safety uniforms for your organization. From headwear to safety vests, it's critical that construction crews have the right uniforms. That's why Chesapeake Uniform wanted to share this helpful guide to make sure you had the right gear for your crew. Not only do you have to worry about keeping your crew safe on the construction site, but you also have to think about the safety issues that are caused by distracted motorists. With a hi-visibility safety vest, however, you are able to keep your workers safe at a very affordable cost. Hi-visibility safety vests are absolutely necessary safety measure for those on a construction site where moving vehicles and equipment are operated. 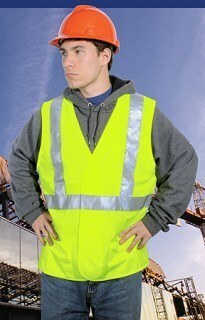 These vests will help your employees stand out against the background environment of your construction site. Chesapeake Uniform has safety vests available in a variety of fabrics and colors that will fit any budget. Warmer weather is slowly on the way, but there can be some cold nights and even cold mornings during the summer. And depending on your location, you may have to continuously deal with rain throughout the year. That's why it's important to have jackets, headwear, pants, and accessories that can help your crew get the job done right the first time. You don't want your crew to be in a position where they aren't prepared, and sometimes you have to finish a job even if the weather doesn't want to cooperate with you. In rainy weather, it's especially important that people are able to see your crew members. Hi-visibility vests allow construction workers to be more visible to vehicular traffic, no matter the speed of the vehicles. You may have signs around your construction site that warns motorists to slow down, but that doesn't mean they are always going to listen. Often, owners of construction companies have a very difficult time finding vests that provide hi-vis while also protecting against the rain. Chesapeake Uniform offers vests ranging from heavy thermal-lined vests to nylon vests, which will keep your workers safe and dry at the same time.